"Conan the Barbarian" is not for everyone. It is certainly a definite type of film and this re-make of the 80's camp classic starring old Arnold Schwarzenegger plays it so safe and by the numbers there seems to really be no point in it even existing. Yea, the story has been altered quite a bit but the basic elements still stand true. And although my history with the original Conan film is in no fashion what makes me put this re-make down so much (I actually just rented the original last week and watched it for the first time) it is simply the fact this movie on its own is more a collage of battle scenes that are pieced together and separated by small bits of dialogue that seem forced and only present to move any resemblence of a story along. If anything, a film like this should be pure escapism, full of excitement and fun but instead this nearly two hour film just feels like a drag most of the time. Yea, I thought the sandmen and the fight with the giant squid looked pretty cool, but they never felt epic and if you are going to make a Conan film the thing needs to at least FEEL epic. The scope and the budget were definitely in place here, but it still feels like the final product we are watching on the screen was produced with little to no effort. The least they could have done is try. Father and daughter get a little too close for comfort. What is an even more saddening fact for this update is that most of the actors here seem to really be into it. Honestly trying to make this as good a movie as it can be. As I said, "Conan" falls into a very distinct category and it is a movie you have to evaluate strictly on its own terms and while I try to do that with every review this came to mind in an especially blunt way with this film. It is clear that Jason Momoa has what it takes to pull off the lead role both physically and charismatically, he is not the issue here. 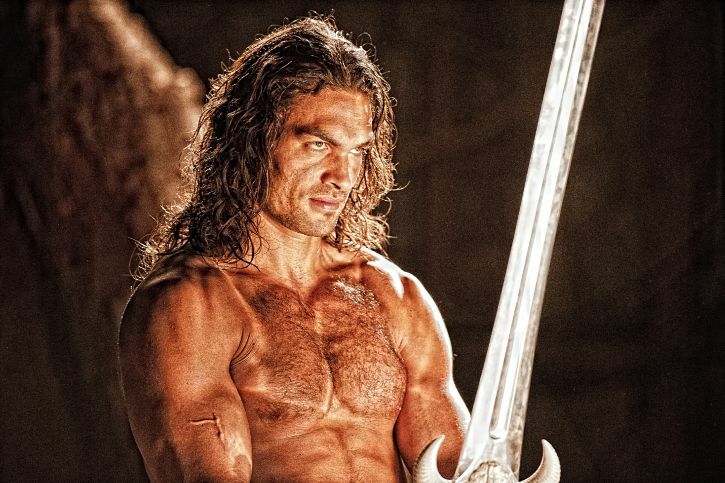 In fact, and this is an opinion solely based on having no emotional connection with the original, but I think Momoa was just as good if not a little better than Arnie. It doesn't hurt he has the ever over acting Stephen Lang in the villain role either. Lang, who most movie goers of my generation will easily recognize as the baddie in "Avatar" does the films best work as Khalar Zym a power hungry ruler who seeks to capture a pure blood ancestor from an ancient blood line that will somehow bring his lost sorceress wife back from the dead. He has his daughter Marique to help him do this as she also possesses a few traits passed down from her mother. Marique as played by Rose McGowan is an evil little thing and though her performance and character design are both pretty interesting we never really dig into her twisted psyche that hints at a fondness for her father that crosses some lines. It is little things such as this that point towards what might have been a more substance-lined barbarian film. over the campfire as they search for Khalar Zym. Momoa has really hinted at wanting this to be a film not just made up of extravagant fight scenes but for those actions to have real substance behind them. And though he has optioned to write the script for the inevitable sequel; this first film has been condensed so much that it has his own, title character, feeling a little cheated. He is given more of a back story here than in the original featuring Leo Howard as a younger Conan and Howard along with Ron Perlman give those opening scenes enough zest to have us intrigued and anxious for what is to happen next. It is when Momoa finally hits the screen that things start to go downhill. The story hits the high points on every action adventure script out there. 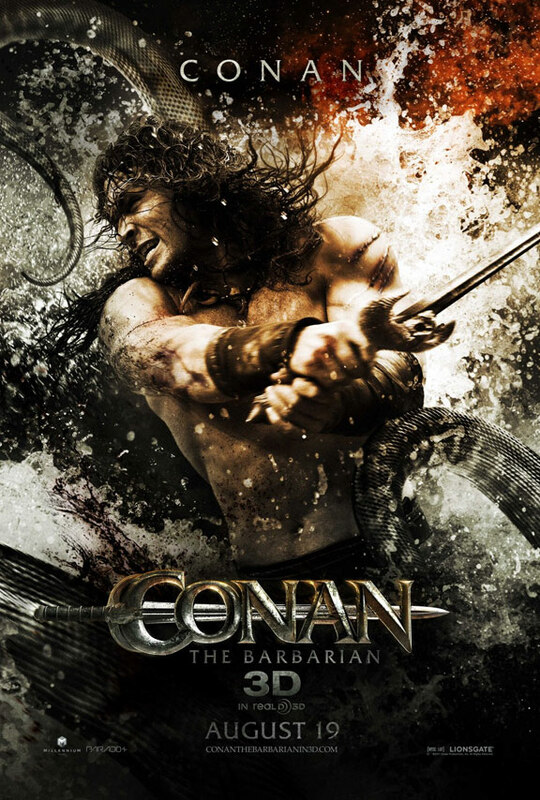 Conan is seeking revenge on Zym who killed his father and Zym is searching for that pure blood. Of course, Conan comes across the pure blood first, is able to have that leverage over Zym but will no doubt fall in love with the pure blood Tamara further complicating things and leading to a final showdown that is so bombastically gory and over the top we just feel dragged around by the time the credits roll. 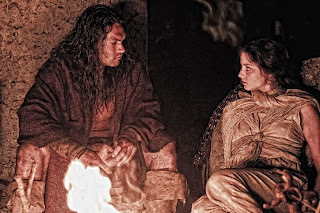 Momoa and Rachel Nichols as Tamara have good enough chemistry and I did like that their stories were not wrapped up too neatly, but all in all we knew where this was heading the moment we sat down. The difference is we expected a few surprises along the way and in that regard is where no effort seems to have been given. Conan is impressed by his own, large sword. What is bad is that it's really hard for me to dislike the film, but I can't help but to feel underwhelmed. When watching the newly issued blu-ray edition of the original film last weekend I of course delve into some special features and learned a few facts I would have never thought to occur. Apparently Oliver Stone had a hand in writing the original script for Conan back in the 80's and even had some interest in directing it for a little while. Why this didn't happen, I don't know, but in the interview with Stone he talked of his script simply being too epic, with hundreds more characters, bigger battle scenes and such to create in those days. And so I, in a way, was hoping with all the advances in technology and a sizeable budget that is what director Marcus Nispel had set out to create. The trailers surely indicated such a world. Nispel, who is mainly known for his work on the re-makes of "The Texas Chainsaw Massacre" and "Friday the 13th" seems a little hesitant to go forward with handling such a colossal order. But the thing is, Conan is a bigger than life character and you have to be willing to go big or go home with this kind of film. the quote that will no doubt catch on from the movie is "I live, I love, I slay, and I am content." Conan no doubt does all these things, but it is a shame that the audience is left only being content with his big screen return.